Transport for short and long distance journeys. We cover Stonehouse, Stroud, Gloucester & all the local areas. We can provide transport on a 24hr basis, contact us today for your requirements. 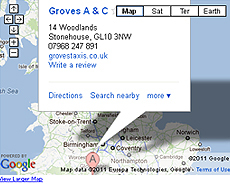 To find out more about Groves Taxis or to book one of our vehicles call us today.